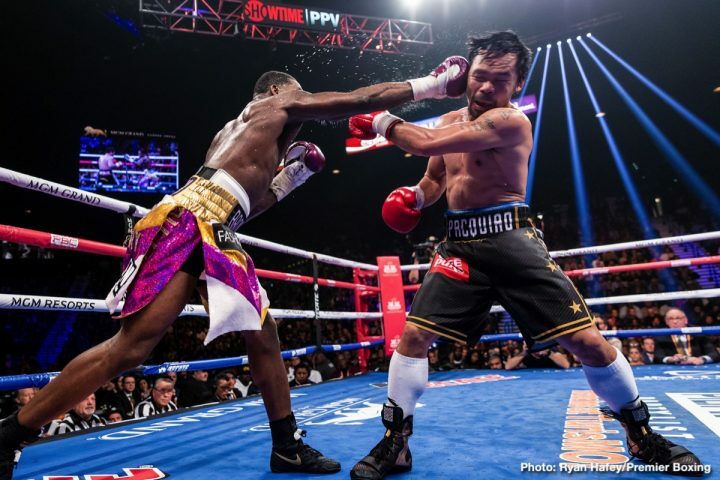 By Chris Williams: Adrien ‘The Problem’ Broner says he might have ended Manny Pacquiao’s career by injuring his right eye in their recent fight on January 19. Former four division world champion Broner (33-4-1, 24 KOs) says he’s hearing that the 40-year-old Pacquiao suffered a detached retina in his 12 round unanimous decision win over the 29-year-old Broner in their fight on SHOWTIME PPV this month at the MGM Grand in Las Vegas, Nevada. It was initially feared that Pacquiao suffered a detached retina, but it’s now reported that the injury is a lacerated cornea, which is expected to heal. “They say I detached his retina, so I don’t know if he’s going to box again, but I hope so. I love him,” Broner said about Pacquiao to TMZ, when asked if he was interested in fighting the Filipino star in a rematch. Pacquiao beat Broner by the scores 117-111, 116-112, and 116-112. The scores could have been more lopsided than that, because Broner looked like he might have won only one round in the entire fight, and that was the fourth. He was outworked. Pacquiao was throwing a lot of punches with many of them being blocked on the gloves of Broner. However, just being the much busier fighter of the two made it easy for the judges to give Pacquiao the win. The win for former eight division world champion Pacquiao allowed him to retain his World Boxing Association ‘regular’ welterweight title. Barring any problems with his injured eye, Pacquiao should be back inside the ring in May or June, defending his WBA secondary 147 lb title likely against one of Premier Boxing Champions’ fighters. There is a chance that Pacquiao could face WBA Super World champion Keith ‘One Time’ Thurman next. It’s up to Pacquiao if he wants the Thurman fight or if he would prefer to face the winner of the Errol Spence vs. Mikey Garcia fight. Thurman didn’t look very good in his win over Josesito Lopez last Saturday night. Broner’s career as a major player is winding down. This was was Broner’s fourth consecutive poor performance from him since 2017. Broner could have lost all four of his last 4 fights against Pacquiao, Jessie Vargas, Mikey Garcia and Adrian Granados. Top Rank Boxing promoter Bob Arum says Broner looks like he’s just been going through the motions in being a fighter in the last several years. Arum didn’t come right out and say it, but it appears that he sees the 29-year-old Broner as an over-the-hill fighter. “I think for the last two or three years Broner has been more of a posture-er than a fighter,” Arum said to Fighthub. Broner can still talk like he used to, but his fighting ability has clearly dropped off in a major way since his best days of his career from 2011 to 2013. There was small window where Broner was fighting well at super featherweight and lightweight. He’s not looked like the same guy since he moved up to 140 and 147.